A further episode in the Unquiet Bones series, following the life and fortunes of Hugh de Singleton, surgeon in medieval Bampton, Oxfordshire Alan, the beadle of the manor of Bampton, had gone out at dusk to seek those who might violate curfew. When, the following morning, he had not returned home, his young wife Matilda had sought out Master Hugh de Singleton, surgeon and bailiff of the manor. Two days later Alan's corpse was discovered in the hedge, at the side of the track to St Andrew's Chapel. His throat had been torn out - his head was half severed from his body - and his face, hands and forearms were lacerated with deep scratches. Master Hugh, meeting Hubert the coroner at the scene, listened carefully to the coroner's surmise that a wolf had caused the great wound. And yet … if so, why was there no blood? 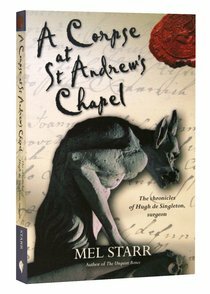 About "A Corpse At St Andrews Chapel (#02 in Hugh De Singleton Surgeon Series)"
Mel Starr was born and grew up in Kalamazoo, Michigan. After graduating with a MA in history from Western Michigan University in 1970, he taught history in Michigan public schools for thirty-nine years, thirty-five of those in Portage, MI, where he retired in 2003 as chairman of the social studies department of Portage Northern High School. Mel and his wife, Susan, have two daughters and seven grandchildren. This item is being reprinted. There will be a delay in fulfillment of your order. 0 Available.